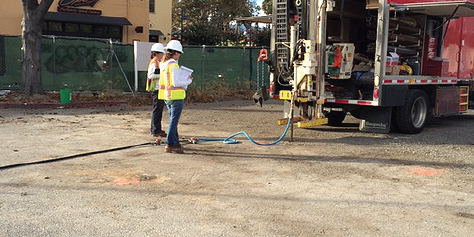 Operations at the site of a former gas station in San Jose, California resulted in contamination of the subsoil and groundwater with benzene. Following demolition of the station after 15 years of operation, the site was approved for redevelopment into a commercial property. However, the site failed to meet the groundwater criteria of the Low-Threat Underground Storage Tank Case Closure Policy (LTCP) for benzene (<3,000 μg/L) concentrations, and remediation activities were quickly undertaken in order to maintain the schedule for site redevelopment. A remediation plan was developed by REGENESIS® that utilized in situ chemical oxidation and enhanced aerobic biodegradation to address the residual petroleum contamination at the site. Due to the extended drought in the area that caused rapidly declining groundwater levels, three separate zones of contamination were targeted in the remediation plan: the groundwater zone and two newly-formed vadose zones that are separated by a low-permeability unit. The 3700 ft2 treatment area included full coverage by the groundwater treatment as well as two distinct regions of the shallow and deep vadose zones. A bench test using soil and groundwater from the site was performed to verify the effectiveness of the planned course of treatment prior to full-scale application. A >99% reduction in benzene concentrations confirmed the remediation plan, and application of the remediation chemistry was performed by REGENESIS Remediation Services (RRS) over two injection events. Due to the prolonged drought in the area, recycled water was brought on site for use in the field activities. The two injection events were separated by one month and each spanned ten days. During the first event, PersulfOx® was applied via direct push technology to 54 injection points. In the second event, ORC Advanced® was co-applied with PersulfOx through 59 points. PersulfOX is a sodium persulfate-based chemical oxidation technology that destroys both hydrocarbon and chlorinated solvent contaminants in the subsurface. PersulfOx contains a built-in catalyst that activates the persulfate component and generates contaminant-destroying free radicals without the need for the addition of a separate activator. ORC Advanced is a proprietary formulation of food-grade, calcium oxyhydroxide that produces a controlled release of molecular oxygen to enhance aerobic biodegradation. Three months after treatment of the site was completed, BTEX concentrations decreased by over 99% from the baseline concentrations of 3070 μg/L. Furthermore, concentrations of all contaminants have been reduced to below the criteria for Low Threat Closure, and as a result of this rapid achievement of site goals, the redevelopment schedule of the site has been preserved.